WASHINGTON, DC, September 15, 2010 (ENS) – Oil and gas companies operating in the Gulf of Mexico will have to set permanent plugs in nearly 3,500 nonproducing wells under a new federal government policy aimed at preventing more oil leaks into gulf waters. In addition, oil companies must dismantle about 650 oil and gas production platforms if they are no longer being used for exploration or production, the Department of the Interior directed today in a Notice to Lessees effective October 15. “As part of our sustained effort to improve the safety of energy production on the Outer Continental Shelf and strengthen environmental protections, we are notifying offshore operators of their legal responsibility to decommission and dismantle their facilities when production is completed,” said Interior Secretary Ken Salazar. The order comes five months after the explosion at BP’s Deepwater Horizon oil rig in the Gulf of Mexico caused one of the biggest oil spill in U.S. history – 4.9 million barrels. “We have placed the industry on notice that they will be held to the highest standards of planning and operations in developing leases and today’s notice reiterates that mandate,” Salazar said. The directive addresses what is known in the oil and gas industry as “idle iron” – wells, platforms and pipelines that are no longer producing or serving exploration or support functions related to the company’s lease. Federal regulations require these facilities to be decommissioned, a process that involves plugging wells and dismantling and removing platform structures and pipelines no later than one year following the expiration of the lease. “As infrastructure continues to age, the risk of damage increases. That risk increases substantially during storm season,” said Michael Bromwich, director of the DOI’s Bureau of Ocean Energy Management, Regulation and Enforcement. “This initiative is the product of careful thought and analysis and requires that these wells, platforms and pipelines are plugged and dismantled correctly and in a timely manner to substantially reduce such hazards,” Bromwich said. Oil and gas producers have asserted that certain platforms, wells and pipelines that have not been plugged and are no longer producing added value to the lease or might one day be used in support of other, active wells and facilities located within the same lease area. They have been reluctant to plug the wells and remove the infrastructure until they met the final decommissioning regulatory requirement which is within one year after the lease expires or terminates. Sometimes that occurs years after the infrastructure has been out of use. “This idle infrastructure poses a potential threat to the OCS environment and is a financial liability to you and possibly the Federal government if subsequently destroyed or damaged in a future event such as a hurricane,” the DOI said in its notice. 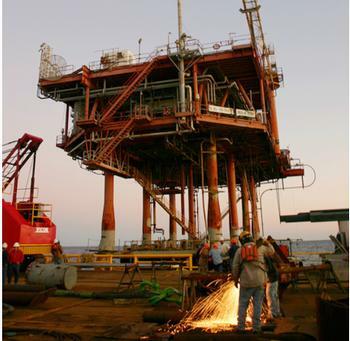 A 2008 Interior Department review of idle structures and wells on active leases in the Gulf of Mexico Outer Continental Shelf found “a significant number of idle platforms that have not been removed and idle wells that have not been permanently plugged,” the agency said. The notice directs operators to prioritize their work based on risk conditions, first removing structurally damaged wells and those on structures with the highest risk of toppling and wells capable of leaking oil. Priority should be given to dealing with “Wells that are located close to the shoreline, environmentally sensitive areas, or other infrastructure,” the agency said. The cost and time to permanently plug wells and remove storm-damaged infrastructure, including pipelines, would be much higher than decommissioning undamaged assets, the agency points out. Today’s directive requires that any well that has not been used during the past five years for exploration or production must be plugged, and associated production platforms and pipelines must be decommissioned if no longer involved with exploration or production activities. Companies will have 120 days to submit a company-wide plan for decommissioning these facilities and wells. The plans must contain details for each individual well and facility, including specific dates for the submission of related permits and for commencing and completing decommissioning work. After the Bureau of Ocean Energy Management, Regulation and Enforcement has approved a company’s decommissioning plan, Bromwich said bureau officials will track the progress of each company and of the industry as a whole.